A highly economical option for busy offices, our Punched Pockets help to protect important documents. Made from a lightweight 30-micron plastic, their transparent nature allows information to be viewed and read without the need for removal. 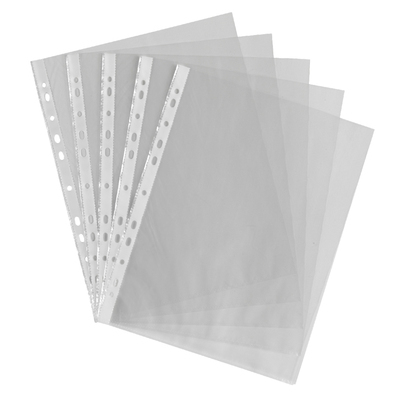 Each one has pre-punched holes down one side, allowing it to fit securely within storage folders and will provide a suitable barrier against folds, tear and damage. Offering exceptional value for money, this is a large and economic pack of 100 individual pockets. Our Stationery Supplies has a wide range of products on offer including our A4 Clipboard in Black - suitable for all professional needs.